Stuffed vegetables can be notoriously time consuming, but a melon baller makes quick work of the squash — I had mine hollowed out in 5 minutes flat. These are round little Israeli zucchinis, what we call kishu, about the size of a tennis ball. The melons for their part are baseball-sized with green honeydew-like flesh and the skin of a cantaloupe — a common variety around here. I hollowed them out and stuffed them, too, although that was more for show since you can’t eat the melon peels. I made two versions of the salad — one with uber-seasonal fresh smoked wheat berries (back in May), and the other with wheat bulgur. The wheat berries have more flavor and therefore demanded less seasoning, but I thought the bulgur salad was a better match for the squash. The wheat berries stand on their own. Heat the oven to 220 degrees Celsius (420 Fahrenheit). 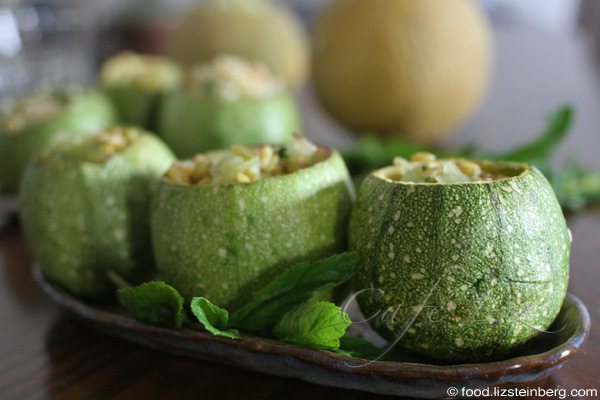 Slice the tops off the squash and hollow them out with a melon baller. Save the insides for another recipe — a soup, a stir-fry, you name it. Arrange them upside down on a baking tray and bake for 15-20 minutes — they should be soft but not caving in on themselves. 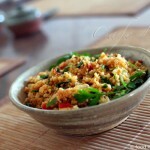 Meanwhile, put the wheat bulgur in a heatproof bowl, and cover it in boiling water. Let sit for about 15 minutes while the squash bake. Finely chop the melon and the mint, and toast the almonds (put them in an unoiled pan on high heat, and stir constantly until they start to brown). Drain the unabsorbed water from the bulgur — you can use a strainer for this; if you leave extra water the bulgur will taste soggy. 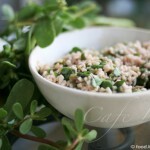 Mix the bulgur with the melon, mint, almonds, lemon and salt. Stuff each squash with about 1/3 a cup of bulgur salad (that’s what fit into the squash I bought). Eat at room temperature. Similar in concept to the bulgur salad, the fresh smoked wheat berries are rich in flavor in their own right and simply need less seasoning than bulgur. Rinse the wheat well — it will be full of grit and chaff. The chaff floats, making it easy to remove. 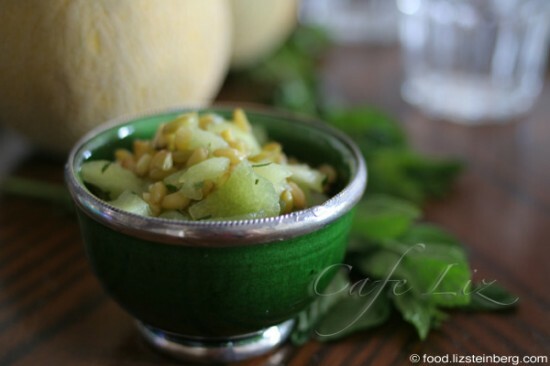 Finely chop the melon and the mint, and mix with the wheat, lemon and salt. 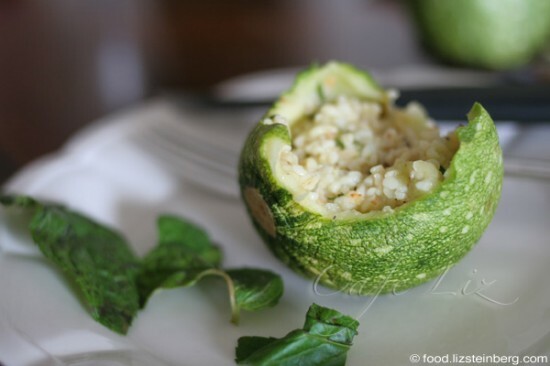 4 Responses to "Cold stuffed squash with bulgur and melon salad"
Such a pretty dish again.I once tried those small round squashes,but thought they were less tasty and much harder than the regular kishuim. I love those little zucchinis. I also use my melon baller to scrape them out, among other things. I make muffins with the guts. 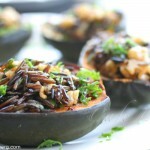 What’s your favorite zucchini-gut dish? Ha, I guess I forgot to post that! I love making a stew or soup with tomatoes, squash, cumin, parsley, etc. I think one of the tomato soup recipes I posted a few months ago was inspired by this dish. Yael, I think that the main reason people buy these squash is because they’re pretty and can be stuffed! Though I have to say, I didn’t think they tasted any different than the squash I regularly buy.